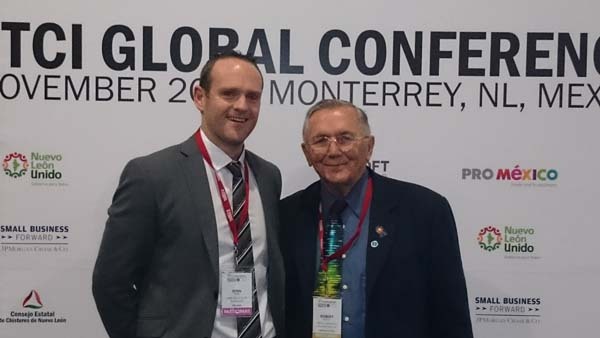 Dr John Hobbs (CIT) was one of speakers at the 17th TCI Global Conference which took place from 10‐13th November 2014 in Monterrey, Mexico. Under the theme of ‘Creating shared value through clusters for a sustainable future,’ the 17th TCI Global Conference addressed the question of how clusters contribute to creating shared value among organizations and in regions and communities. TCI connects committed officials from government agencies that aim to support innovation and competitiveness with dynamic people working in and for companies in cluster organisations that are close to the market. The target of the conference was to illustrate in a practical way how innovative clusters can play a key role in the creation of shared value for economies and societies. The future economic, social and environmental development depends on the capacity of organisations to operate under a model of ‘across‐theboard value’ creation. The role of clusters supporting this effort and thus the importance of crosscluster cooperation will be critical in order to have a satisfactory long‐term outcome. The exchange of views on this issue was one of the main aspects of the conference. CyberForum’s best in class approach to ‘How does Innovation work?’ was presented at TCI through a session entitled ‘Cluster as a tool to create global innovation winners and increase competitiveness’ where work developed by Tamara Hoegler was presented by Camilla Christensen from Lund University Open Innovation Centre. “Isolated projects, initiatives and clusters lose a huge part of their innovation potential. CyberForum lives and practices its mission statement ‘Connect. Combine. Cooperate.‘ every single day, bringing together different actors, sharing knowledge, experience and information and thus enabling a real innovation boost. Sharing ideas means also getting new ones!” said Hoegler. The benefits of the TCI conference continue to still forthcoming as Dr Hobbs trip has been extended through one of the networking sessions produced an invitation to give a presentation at Massachusetts Institute of Technology’s, Martin Trust Center for Entrepreneurship to share V‐LINC results and its inputs into BeWiser project whilst on his return to Ireland. Cork Institute of Technology, Bishopstown, Cork, Ireland. Be Wiser (Building Enterprises – Wireless and Internet Security in European Regions) is a 36 month project funded under the Seventh Framework Programme (FP7) of the European Commission. It involves twelve partners from seven European countries and aims to strengthen the research, innovation potential and global competitiveness of European regions by bringing together research actors, enterprises, institutions and policy makers into a collaboration network. Lead partner is Systematic Paris Region.